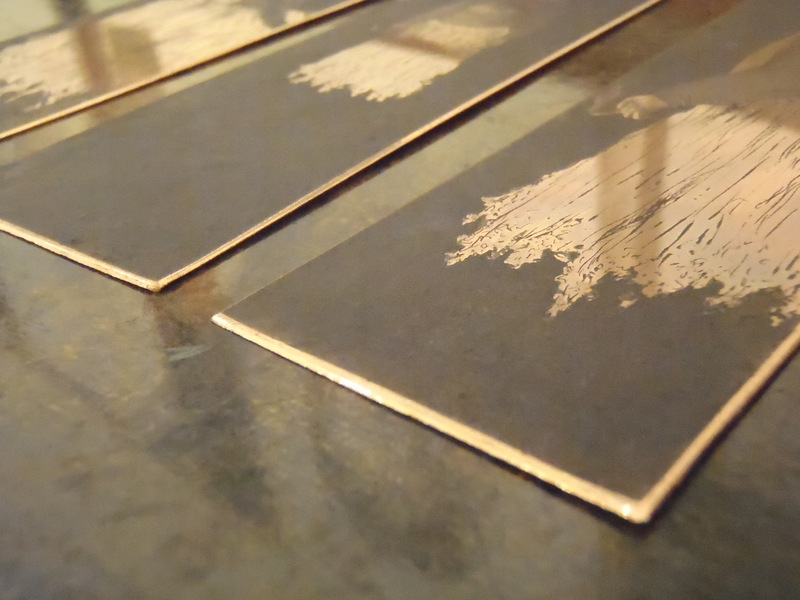 Etching is a fine art process used to produce an original print. It is an intaglio technique meaning the image is established below the surface of a metal plate. The artist makes a drawing on the plate using many different techniques and materials. The artist covers parts of the plate and leaves other parts exposed. The plate is then immersed in a bath of corrosive acid and the exposed lines and tones of the artist’s drawing are bitten into the surface of the plate. The resulting grooves, tiny marks and holes are then filled with printing ink by covering the entire plate with colour and wiping the surplus away. The ink charged plate is then covered by a sheet of dampened paper and passed through an etching press where immense pressure transfers the image from metal to paper. Etching has been used by artists for centuries and for centuries and the process has not changed much since before the Renaissance. Durer, Rembrandt, Goya, Picasso, Morandi and Hockney all produced important works in the medium. Printmaking and particularly etching has become very popular in Ireland over the last few decades through the establishment of half a dozen print studios around the country. Go bunúsach, is próiseas saorealaíona é an eitseáil chun prionta a dhéanamh. Modh intaglio atá ann, a chiallaíonn go bhfuil an t-íomhá ina luí faoi dhromchla ar phláta mhiotail. Le tosnú, is féidir leis an ealaíontóir rian a tharraingt ar an bpláta ag baint usáid as teicnící agus ábhair éagsúla; bíonn cuid den phláta greanta agus cuid eile de fágtha nocht. Tumtar an pláta ansan i bhfolcadh aigéide agus déantar línte agus marcanna an ealaíontóra a chreimniú ar dhromchla an phláta. Mar thoradh ar an bpróiséas seo fágtar claiseanna, eanganna agus poill bheaga ar an bpláta. Cuirtear dúch ar an bpláta ansan agus clúdaítear é le páipéar tais. Nuair a chuirtear tré chlóphreas é aistríotar an t-íomhá ón bpláta go dtí an páipéar de thoradh ard-bhrú. Tá eitseáil in úsáid ag ealaíontóirí leis na céadta bliain agus níl puinn athrú tagtha ar an bpróiseas ó aimsear na hAthbheochana. D’úsaid Durer, Rembrandt, Goya, Picasso, Morandi agus Hockney uilig an teicníc seo chun saothair tábhachta ealaíona a chruthú. Tá borradh tagtha ar an bpríontáil in Éireann le roinnt blianta anuas, go háirithe san eitseáil, agus tá leath-dhosaen ceardlanna priontála bunaithe timpeall na tíre.